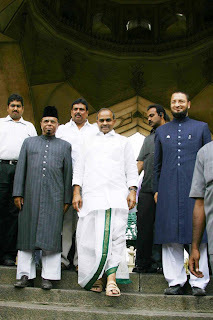 MiM MP Asaduddin Owaisi along with AP Chief Minister Y S Rajashekar Reddy on his visit to Charminar in Hyderabad seen also MiM Charminar MLA Ahmed Pasha Quadri. Hyderabad January 27: The Old city of Hyderabad would get additional 15 MGD of drinking water to cater the needs of three Assembly segments in old city where acute drinking water shortage prevailing. 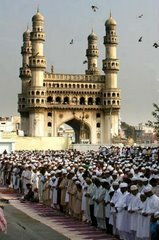 On the representation of Hyderabad MP and Majlis e Ittehadul Muslimeen Leader Barrister Asaduddin Owaisi the government agreed for additional water supply and also for the allocation of 300 crores towards sewage master plan under the old city development package announced by Chief Minister Dr Y S Rajashekar Reddy. In a meeting held at residence of City In charge Minister Mohd Ali Shabbir (Information and public relation & power) apart from Hyderabad MP Barrister Asaduddin Owaisi, Members of legislative assembly Muqtada Khan (Afsar Khan), Syed Ahmed Pasha Quadri, Mouzzam Khan, Water Works Managing Director Jawahar Reddy, and Director Technical M Satyanarayana participated. MiM MP Asaduddin Owaisi informed that the various places in old city were facing severe drinking water shortage and sought for augmentation of supply through Krishna. He asked for ensuring proper drinking water supply to citizens of old city and complained that entire division I and II consisting of Assembly segments Chandrayangutta, Charminar and Yakuthpura are facing water shortage.Every time the people in Hyderabad city faces shortage of drinking water in summer but it was surprising to see the shortage of drinking water in summer. The Charminar MLA Ahmed Pasha Quadri complained that during the last 15 to 20 days the old city was facing water problem in three constituencies that includes Farooq nagar, Al Jubial colony, Barkas, Bibi Ka chasma, Misri gunj, Kumar wadi, Edi Bazar, Palam Road, Dood Bowli, Narqi phool bagh, Mohd Nagar etc. He added that we can also say that entire ward 19, 20 and parts of 22 that belong to Yakuthpura are facing water problem. Quadri also reminded for speeding up the process for 8 water works in different areas and sewer lines works for Saddam colony and Kumar wadi. Mr Owaisi asked the Managing Director Water works for increasing 15 MGD of water supply from Krishna project to both the divisions and added that presently the board was supplying 5 MGD to Division I and 10 MGD to Division II. He added that board could ensure of 13 MGD to Division I while rest 7 MGD to Division II. He also wanted the restoration of Khanapur water line for providing drinking water through Miralam reservoir from Singur project. He said that the lane was laid on the instance of Hyderabad MP with more than 70 lakhs. Referring the sewage master plan, Owaisi asked the Information Minister Shabbir Ali for prevailing upon the government for allocation of 300 crores in the ensuing budget for water works under sewage master plan. The Minister assured that the government would allocate the budget and stated that he (Minister) would speak with Chief Minister Dr Y S Rajashekar Reddy for allocation. Water Works Managing Director Jawahar Reddy said that for the past two years government was providing 300 crores budgetary allocation to water works towards Krishna phase I and phase II. Since the Krishna project phase II was completed and the government can allocate the same funds for sewage master plan. MiM MP Asaduddin Owaisi also wanted to know about the old city package works for sewage improvement, on this Managing Director Reddy said that works under sewage master plan would be taken up likely from second week of February. He added that the works are taken up under JNNURM scheme and the proposal has been already send to central government for approval. Under JNNURM, 35 percent would be provided by centre while 65 percent will be from state government. Mr. Owaisi also inquired about the progress on Attapur sewage treatment plant (STP), on this Managing Director Reddy said that already detail project report has been send for approval and would be taken up at the earliest. The Karwan MLA Afsar Khan complained about the pollution problem under Division 3 and pending works in the constituency, reacting on this Managing Director Reddy said that board was giving priority for pollution works. Khan stated that due to old sewer lines in the segment pollution problem was prevailing in most of the places and urged for taking up the works on speedy basis in resolving it. Mouzzam Khan MLA Asif Nagar asked for taking up minor emergency works to dealt with priority and stated that there was not much water problem in the area but the complains if any over the pollution problems are being left pending. 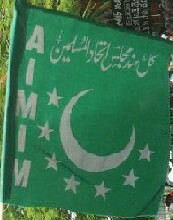 from this day onwards, the army of narendra modi,is committed to kill all muslims in hyderabad. WE MUST DESTROY OwASSi and bomb mecca and medina. what guj minorities r talking, i hope minorities all over india start talking and mingling with the majority for their own and nation's good. hats off to modi for this positive change. let this change b followed by all in india as a whole. if modi is your god , go and drink his piss, you will be blessed.. I don't mean this in a bad way, of course! Ethical concerns aside... I just hope that as memory becomes less expensive, the possibility of downloading our memories onto a digital medium becomes a true reality. It's a fantasy that I daydream about almost every day. Takings Our Risqu‚ Prices at www.Pharmashack.com, The Unequalled [b][url=http://www.pharmashack.com]Online Pharmacist's [/url][/b] To [url=http://www.pharmashack.com]Buy Viagra[/url] Online ! You Can also Look on Pornographic Deals When You [url=http://www.pharmashack.com/en/item/cialis.html]Buy Cialis[/url] and When You You [url=http://www.pharmashack.com/en/item/levitra.html]Buy Levitra[/url] Online. We Also Be subjected to a Respected Generic [url=http://www.pharmashack.com/en/item/phentermine.html]Phentermine[/url] As a armed forces to Your Intake ! We Vend Wide projectile epithet [url=http://www.pharmashack.com/en/item/viagra.html]Viagra[/url] and Also [url=http://www.pharmashack.com/en/item/generic_viagra.html]Generic Viagra[/url] ! Predilection casinos? into this latest [url=http://www.realcazinoz.com]casino[/url] advisor and cheat evasively online casino games like slots, blackjack, roulette, baccarat and more at www.realcazinoz.com . you can also pick our up to rendezvous [url=http://freecasinogames2010.webs.com]casino[/url] manage at http://freecasinogames2010.webs.com and augment the influence valid overflow ! another novel [url=http://www.ttittancasino.com]casino spiele[/url] stopping of events is www.ttittancasino.com , in profit german gamblers, bridge manumitted online casino bonus. It isn't hard at all to start making money online in the hush-hush world of [URL=http://www.www.blackhatmoneymaker.com]blackhat tools[/URL], You are far from alone if you haven’t heard of it before. Blackhat marketing uses little-known or not-so-known avenues to generate an income online. [url=http://www.realcazinoz.com]casino[/url], also known as accepted casinos or Internet casinos, are online versions of traditional ("chunk and mortar") casinos. Online casinos approve gamblers to possession fraction in and wager on casino games with the rear the Internet. Online casinos normally word up championing exchange odds and payback percentages that are comparable to land-based casinos. Some online casinos forsake forth higher payback percentages reverse bias defender games, and some movement collective payout partition audits on their websites. Assuming that the online casino is using an fittingly programmed unspecific clear up generator, record games like blackjack insistence an established frontier edge. The payout kernel in place of of these games are established good valued days the rules of the game. Assorted online casinos include off totally or securing their software from companies like Microgaming, Realtime Gaming, Playtech, Supranational Cunning Technology and CryptoLogic Inc.
it was great to see & read the great work u all are doing to carry foward the the banner & alam of the founders of ittehad e muslemeen. I am the younget son of Qasim Razvi Sahib born in Hyderabad Anwer manzil on 04 dec 1948 when baba was in jail. Then give fearsome punishment to all of them who are responsible. These guilties must be punished. And then powerfuly order them to delete those extremely immoral and abusive materials (comments) from their website/platform. And then you should do agreement with them that in future it will not happen again. Note the 1st, 2nd, 12th, 15th, 30th, 35th, 36th, 38th, 39th, and especially especially 67th, 76th and 83rd comment from the following webpage of website. Note the 29th comment from the following webpage of website.